This tutorial explains how to reshape data by converting multiple variables from long format to wide format. This tutorial explores 'Double Transpose' SAS method which is used to transpose multiple variables. It's a very handy technique to solve this challenge. Otherwise, it would be a very time consuming task. This post includes a sample data set which is used for demonstrating the method for transposing more than one variable. 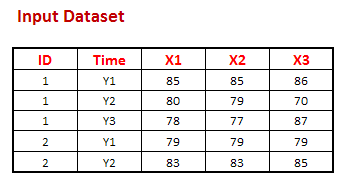 The code below creates a data set named 'temp' which constitutes five variables - ID, TIME, X1, X2, X3. 1. First step, it is required to sort the variables 'ID' 'time' before using them in BY statement in PROC TRANSPOSE. It is done with PROC SORT. 3. Second transpose further reshapes the data from long to wide format. It generates the desired output. The delimiter= option is used to place a separator that separates values of two ID variables. 4 Responses to "SAS : Transpose Multiple Variables"
Why is that? Thank you very much for your help!